In 2016, Auckland Airport collected $52 million from parking fees. 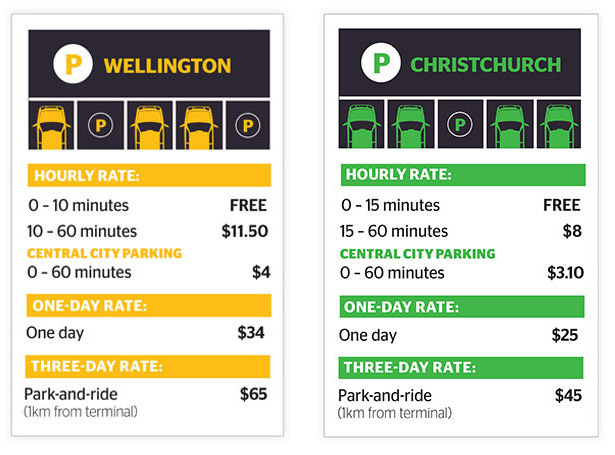 At Wellington Airport, rates for an hour’s parking are more than double what you pay to park in the city centre. Are consumers being fairly charged? We've compared parking prices at our three biggest airports, with rates charged for central city parking and at other airports around New Zealand. Wellington’s airport car parking woes erupted into a spate of tyre slashing last year. Travellers put off by the airport’s pricey parking have opted to leave their vehicles on nearby streets and walk to the terminal. But one local resident became so irate with the congestion on his road he slashed the tyres of more than 100 cars. The case hasn’t deterred Wellingtonians fed up with the airport’s charges from leaving their cars in nearby suburbs and going the rest of the way on foot. Businessman Bryn Williams would rather walk. “I’ve parked at the airport before, but it’s one of the worst car parks I’ve ever come across. The layout is shocking. The pricing is shocking. It’s just ridiculous,” he says. A Wellington couple leaving the airport on a Friday night also described the parking fees as “ridiculous”. The tyre-slashing episode left them “a bit more mindful” of where they park, but it hasn’t stopped them leaving their car in nearby Miramar. The capital’s travellers may be justified in feeling aggrieved about the airport’s fees. 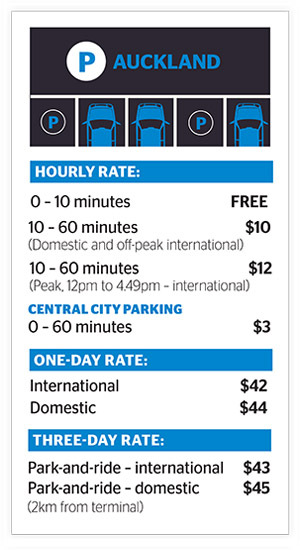 Rates for an hour’s parking are more than double what you pay to park in the city centre. They’re also higher than hourly rates at either Christchurch or Auckland’s domestic terminal. 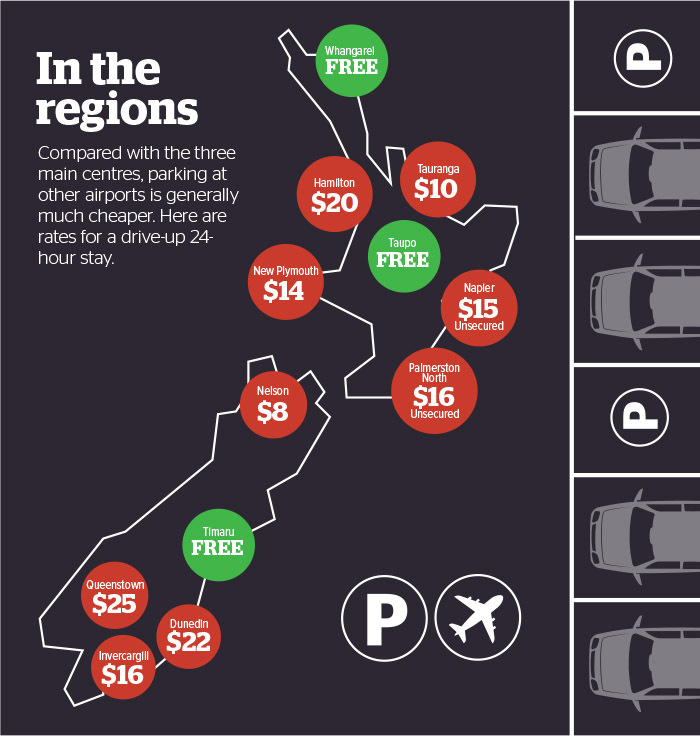 For longer stays, Wellington’s drive-up price for three-day parking is also the highest of the three centres. But Auckland is the most expensive for 24-hour parking within walking distance of the terminal (see “Airport parking charges”). In 2016, Auckland Airport collected $52 million from parking fees. Because they don’t face competition for most of the services they provide, the three airports are regulated by the Commerce Commission. The Commerce Act gives the commission oversight powers when there’s little or no competition in a market. But it’s only services relating to the landing and departure of aircraft, such as plane refueling and baggage handling, that come under scrutiny. The airports must disclose how much profit they’re making from these services so consumers can judge whether the return is reasonable. The same oversight doesn’t extend to car parking and there’s no intention for that to change. Airport parking hasn’t been considered a monopoly service given there are alternatives — such as taking a bus, shuttle or taxi. This means it’s up to the airports to set fees and decide whether they publish information on the money they make from them. Only Auckland Airport is completely upfront about its parking revenue. In 2016, it collected $52 million, up from $43 million in 2014. Christchurch Airport releases its ground transport and trading revenue, which combines parking and fees from taxis and shuttles. That totalled $20.8 million last year, down from $25.7 million in 2015. 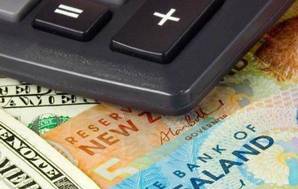 Wellington Airport publishes its combined income from retail activities. The figure includes shopping and restaurant revenue as well as parking fees. In 2016, these activities generated $35.7 million. But how much of this was from parking isn’t disclosed. Auckland Airport retail and commercial general manager Richard Barker argues its rates “compare extremely favourably” with other major international airports across Australasia. In Australia, a day’s parking close to a terminal can cost between $49 and $65; Auckland’s rate is $42 for international and $44 for domestic facilities. To cater for pick-ups, the airport introduced a 30-minute free waiting zone for cars at both terminals last year, Mr Barker says. Wellington Airport spokesman Greg Thomas defended the capital’s prices, stating many parking bays were closer to the terminal than other airports’ and fees reflected this. He says “the vast majority of traffic coming through the airport, up to 80%, is dropping off for free” and hourly rates are priced “to ensure there is enough available space for day parkers”. When setting prices, the airport tries to strike a balance between meeting the demands of travellers and investing to improve its wider transport facilities, he says. However, since details about the revenues and profits of these services aren’t publicly available, there’s no scrutiny of whether it’s got the balance right. The geography of Wellington’s site and the lack of a large industrial zone with sufficient flat land means extending car parking facilities is a more expensive undertaking than for Auckland or Christchurch. While Auckland Airport’s planned 1000-space park-and-ride lot will cost less than $13m, the 1000-bay parking and transport building under construction at Wellington Airport has a budget of $70m. Over the ditch, car parking profits at Brisbane, Melbourne, Perth and Sydney airports are monitored by the Australian Competition and Consumer Commission (ACCC) to protect consumers from unreasonable fees. These airports arguably have more transport alternatives for passengers than those in New Zealand. Sydney and Brisbane airports are connected to the downtown train lines, and Perth’s terminals will be in 2020, though Melbourne Airport has no rail link. Unlike the situation here, the ACCC considers airport parking a monopoly. Its reasoning is that airports can charge whatever fees they wish for alternative transport services such as taxis, shuttles and buses to access the terminals, and discourage competition to their on-site car parks in this way. Major New Zealand airports have the potential to wield the same power. Auckland, Wellington and Christchurch airports all charge fees for other transport providers to use their terminals. These fees will inevitably be added to the price the consumer pays. Your only option to avoid them is to walk, or squeeze a pick-up within the 10- to 15-minute free access window. The Australian commission lobbied for more control of airports in 2011. The agency wanted to be part of negotiations that the airports have with transport operators, such as taxi companies and off-site parking providers, to tip the balance of power away from the airports. Australia’s Productivity Commission decided such a move was too heavy-handed, though it did support the ACCC keeping an eye on parking profits. Back here, detailed analysis of the airports’ parking profits isn’t possible given the limited information the companies publish. Unless that changes, consumers won’t be in a position to gauge whether the fees they’re paying are fair. If you’ve got to visit the airport, you can find discounted parking online. Wellington Airport advertises 25% discounts on standard rates if you pre-book through its website. On Auckland Airport’s website, we found discounts of up to 10% for advance bookings for its park-and-ride option. The company says you can save up to 50% online for closer parking facilities. Christchurch Airport also offers weekend, long weekend and week-long deals on its website, though we found these discounts don’t always apply to its cheapest parking option (the EconoPark facility with a free bus to the terminal). Travellers at Christchurch who book online can use a special entry system, where cameras scan the number plate of the car to confirm its entry and exit. The savings can make online booking worthwhile but keep an eye on your receipts and credit card statements. Several Consumer members have contacted us complaining they’ve been charged twice or found extra fees on their bill from the airports. One member reported being charged for a month’s stay when they’d parked for a day. If you discover an error, contact the airport straight away and request a refund. GUIDE Hourly rate shows drive-up parking prices at the three biggest airports compared with rates charged at downtown council-owned parking buildings and lots. Of the three cities, Wellington was the most expensive, with the exception of Auckland’s international terminal five-hour peak period when prices are 50¢ higher. One-day and three-day rates for one-day parking within walking distance of the terminal, Auckland rates were highest; Wellington was the most expensive by $20 for a three-day stay using park-and-ride services. Prices were collected in February and March 2017.